ATLANTA, Georgia (CNN) -- A 20-inch machete from Costa Rica. New power drills with the tags still hanging. A pile of brass knuckles and nunchucks. Tubs of golf clubs, baseball bats and 10-pound exercise weights. 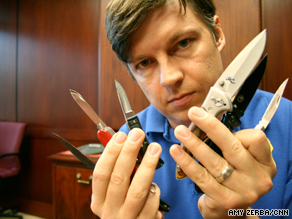 An Atlanta TSA officer holds up some prohibited knives surrendered by passengers over the last month. These objects -- collected at Hartsfield-Jackson Atlanta International Airport security checkpoints -- are among millions of items confiscated by the Transportation Security Administration from travelers' carry-on bags each year. After the U.S. government expanded the list of items prohibited on airplanes in response to the attacks of September 11, 2001, air travelers have few options but to surrender their Swiss army knives, cake cutters or whatever banned loot lies in their carry-on bags. Between 2005 and 2006, TSA confiscated 13 million prohibited items, according to a TSA spokesman. On an average month, Hartsfield-Jackson Atlanta International Airport, the busiest airport in the world, takes 1,000 pounds of items from passengers. Ever wonder where all the junk goes? But the remaining items that possess some value -- knives, corkscrews, electric saws, meat cleavers and wrenches -- are donated to state surplus agencies. They go up for sale at warehouse auctions, retail stores and online Web sites such as eBay, and states keep the profits. Thrifty citizens can expect to buy the goods for cheap -- often just a fraction of the retail price. "It's not slowing down," said Gary Thornton, program coordinator for the Division of Surplus Property in Kentucky. "We figured the program would last for a few years and property would stop coming in because people should know better, but it hasn't." Thornton's agency collects leftover contraband items from various airports in Florida, Ohio and Kentucky. State agencies and youth organizations such as the Boy Scouts of America get dibs, for just a few dollars per item, on the 10,000 pounds of airport contents brought to the state each month. The unsold items go on to eBay, where the public can pick up knives and Leatherman multitools, usually for 50 percent off the retail price. For several months, Thornton recalls receiving hundreds of miniature baseball bats from Louisville International Airport in Kentucky. They found a nice home for the bats at the Louisville Slugger Museum and Factory. TSA reports that bats, clubs, knives and blades remain the most popular contraband items passengers try to take onto airplanes without realizing they are illegal. Prior to 2007, cigarette lighters were illegal. Security officers were gathering 22,000 lighters each day before TSA decided to lift the ban so officers could focus on finding more dangerous items. TSA doesn't profit from any of the collected items, officials said. Travelers have the option to save their prohibited items by transferring the object to their checked luggage or placing it in their car. Passengers can mail the objects back to themselves if there is a post office nearby. But 90 percent of passengers, who are in a rush to catch a flight or don't want the hassle of leaving the security line, just give the items up, says Shekia Gay, a TSA security officer in Atlanta. He said most passengers he encounters are very understanding about leaving behind their belongings, because they know the rules are meant to keep the public safe. But sometimes surrendering items can result in tears. Gay said once a female passenger came through with a set of expensive kitchen knives that was a wedding present. "She was very upset and distressed," he said. "Her husband had to calm her down, and we kept telling her this is what we have to do." Eight years after September 11, travelers continue to bring banned items through the airport security checkpoints, despite continuous efforts by the TSA and airports to publicize what items aren't allowed. With more than 2 million passengers screened by TSA on any given day, officers say they are bound to collect prohibited possessions, said Jon Allen, a TSA spokesman. "A lot of the things prohibited at checkpoints are allowed to go into checked bags," he said. "If there are items people really need, like a baseball bat or power tools, they can put it in their suitcase and it will still make the trip." Even items that seem obvious to avoid are brought into security checkpoints. A few years ago, Allen said, a traveler tried to bring two gallons of gasoline because he was concerned his car would run out of gas en route from his home airport. Six months ago, a kitchen sink was found in one man's bag in a Washington airport. The gasoline was disposed of. The kitchen sink was put up for sale. Shane Bailey, director of the Surplus Property Division in Alabama, says he has seen some unusual items -- most notably, a samurai sword -- in the six years his agency has been taking TSA's airport junk. The division picks up leftover booty from Orlando International Airport in Florida. Disney World's home airport yields plenty of fake pirate swords, and the TSA does not allow replica weapons, or even decorative belt buckles shaped like guns or plastic toys, to go aboard. Bailey said the swords are donated to nonprofits working with underprivileged children. On occasion, Alabama airport junk sifters will find family heirlooms or valuable memorabilia. The Alabama surplus staff once discovered a knife engraved with the New York Fire Department logo and a serial number. They tracked down the rightful owner and shipped it back to New York, free of charge. "If there is a way to get the special items back to someone, we'll go that extra mile," he said. But some travel critics and passengers say taking their stuff is obnoxious and does little to deter terrorist threats. Eric Weiner, a columnist for WorldHum.com, a Web site about the travel experience, says he thinks collecting junk from passengers just provides an illusion of security. "TSA knows collecting peanut butter and nail clippers is not really going to prevent a terrorist attack," Weiner said. "It might catch some very stupid terrorist, but not the smart ones."